Since June, San Diego and Los Angeles have passed a trio of minimum wage increases. Which city will be next? As the Democratic proposal to raise the minimum wage to $10.10 an hour remains stalled in Congress—trapped in today’s Republican-made legislative purgatory—cities around the country have begun doing end-runs around the gridlock. San Francisco, San Jose, Santa Fe and Washington, DC, have all passed their own minimum-wage boosts, while Seattle set the record this spring with its $15 an hour minimum-wage hike. Now, San Diego has joined the effort, recently passing an ordinance to lift the city minimum to $11.50 an hour, and Los Angeles may be heading in that direction. Will more cities follow? And which will be next? Agnes Radomski and John Thomason bring the story from out West. This past Monday, San Diego bucked its conservative reputation by joining the parade of West Coast cities that are fighting inequality by raising the minimum wage. In a 6-3 vote, the City Council passed an ordinance to bump the minimum wage from $9 an hour to $11.50 an hour and allow full-time workers to earn up to five paid sick days a year. The change will unfold over three years, before being indexed to inflation, and will affect as many as 214,000 workers by 2017. The new $11.50 minimum represents a more modest figure than the the one originally proposed by City Council President, Todd Gloria, and supported by a coalition of progressive San Diego groups. That proposal—for $13.09 an hour—was beaten back by the usual cast of minimum-wage antagonists, including the local chapter of the California Restaurant Association, the San Diego Hotel-Motel Association and segments of the business community. Still, the San Diego ordinance outstrips the statewide minimum-wage increase that was signed into law last year by Governor Jerry Brown and that boosts California’s wage floor from its recent high of $9 an hour to $10 an hour by 2016. It is also one of the few times that a single measure has been used to tackle the twin issues of paid sick leave and the minimum wage. San Diego’s minimum-wage raise comes amid powerful shifts in the city’s once-predictable landscape. As immigrants have helped transform San Diego from a majority white to a majority non-white town, they (along with others) have tugged the city gently leftward, forging potent new alliances along the way. At the same time, San Diego’s rising cost of living has turned it into one of the top ten most-expensive cities in the United States. According to the Center on Policy Initiatives, a nonprofit San Diego–based research center, more than 300,000 households across San Diego County don’t earn enough money to cover basic living expenses. CPI estimates that a person working forty hours a week would have to make at least $13.09 an hour to cover basic costs like housing, transportation, food and healthcare. This, of course, was the figure that Gloria proposed this past April, a few months after giving a forceful address in which he argued that the statewide minimum raise did not go far enough. “No one who works full-time should live in poverty,” Gloria said. At the time, he was serving as interim mayor after the city’s previous mayor, Bob Filner, was forced to resign amid allegations of sexual harassment. Gloria resumed his role on the City Council in March, after Republican Kevin Faulconer was elected the new mayor, but by then his call for raising the minimum wage had been picked up by San Diego’s expanding progressive base. That coalition, Raise Up San Diego, includes the Center for Policy Initiatives as well as labor unions, immigrant rights groups and service providers. The campaign is endorsed by the San Diego LGBT Community Center, San Diego’s NAACP chapter and several other organizations and small businesses. Many of the groups had collaborated on issue work, elections and voter-turnout programs in the past. The last several years of work gelled into what Crawford views as a growing progressive movement in San Diego. “In some ways this coalition is like the fruit of all that work,” she said. Alor Calderon is the program director for the Employee Rights Center, which was actively involved in Raise Up San Diego. He’s also the chairperson for the San Diego Immigrant Rights Consortium. Like Crawford, he hoped the raise would come closer to Gloria’s original $13.09 figure. But he still sees the increase as benefiting San Diego’s growing population of immigrants, many of whom work in lower-wage industries like construction, retail, security and hospitality. 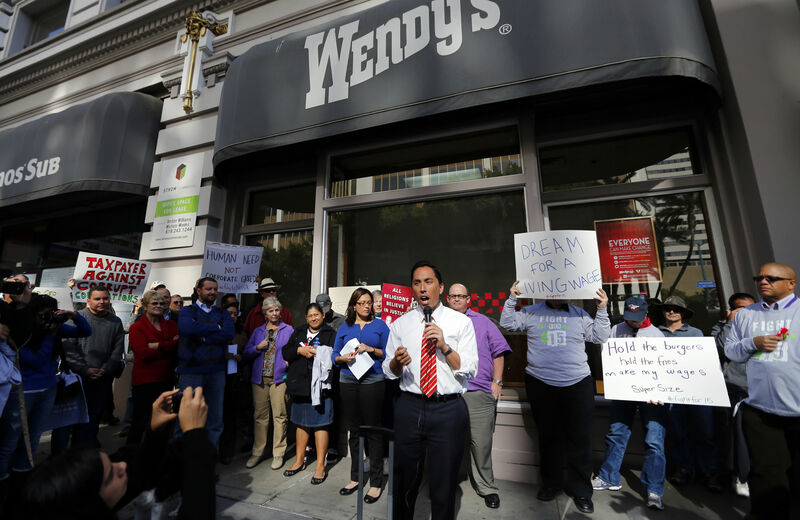 “It’s a big part of our economy, it’s a big part of our structural inefficiency and so the immigrant community, definitely, definitely tried to push for a raise in the minimum wage,” he said. San Diego’s expanding immigrant community is just one indicator of the city’s transformation. Alongside its newfound diversity, the city has begun to shift politically, from reliably Republican to a more complicated patchwork of blue, red and purple. San Diego may have a Republican mayor, for instance, but the City Council has a Democratic majority. And while Democrat David Alvarez may have lost to Faulconer in this past February’s special election, the mayoral race garnered national attention as people watched to see if San Diego would seat its first Latino mayor. It’s no surprise then, that the Raise Up Coalition drew inspiration from progressive Seattle, San Francisco and San Jose. “San Jose is something that sort of falls off the radar screen a lot, but they passed the minimum wage in 2012 there, and that’s actually been a tremendous resource for our campaign,” said Crawford. While the minimum-wage boost is seen as a victory, Crawford and Calderon note that it’s only the beginning. A more aggressive campaign to raise the minimum wage to $15 an hour may be the next step for San Diego’s growing progressive movement. “That, we believe, would be supported by voters in November of 2016,” said Crawford. Will Los Angeles Be the Next Front in the Minimum Wage Fight? On July 1, the city Board of Education unanimously approved an agreement with Local 99 of the Service Employees International Union to raise the minimum wage to $15 per hour for the non-teaching employees represented by the union. The agreement will dramatically boost the wages of roughly 20,000 custodians, cafeteria staff and other service employees who are currently earning as little as $8 an hour. But its effects could ripple well beyond classrooms and cafeterias. The Los Angeles Unified School District is the second-largest school district in the country and one of the top employers in LA County. It is also the largest public employer in the country to reach a minimum wage agreement of this kind, according to schools Superintendent John Deasy. Given the scale of the agreement, it could generate momentum for potential minimum wage increases across the region. The schools agreement followed just a few days after the city council pushed forward another major wage initiative: the long-running effort to raise minimum wages for employees of the city’s large hotels. The council’s Economic Development Committee directed the city attorney to draft an ordinance that would raise the minimum wage for hotel workers to $15.37 an hour. Mayor Eric Garcetti has announced his intention to sign the bill into law if it passes. The campaign for living wages at the city’s large hotels carries particular significance, because tourism is one of LA’s dominant industries. It filled the regional void left by the flight of defense-oriented manufacturing when the Cold War came to a close. But while manufacturing offered attractive middle-class compensation packages, hospitality wages are low. Forty percent of hotel workers live in poverty. Given LA’s widespread poverty, exorbitant cost of living and progressive reputation, one might wonder why more comprehensive efforts to raise the minimum wage have not been attempted. A recent Los Angeles Times op-ed by Peter Dreier and Harold Meyerson called the lack of a coordinated campaign for a citywide minimum-wage boost “surprising.” Yet Dreier, who is a professor at Occidental College and board member of the Los Angeles Alliance for a New Economy (LAANE), a policy and organizing group aligned with LA’s labor movement, is optimistic about the prospects for such a measure. “I’m pretty confident that sooner or later LA will follow Seattle’s example,” he said in a recent phone conversation. The rhetoric of local officials is beginning to reflect this. City Council members Gil Cedillo and Mike Bonin—both Democrats who took office last summer—have called openly for a universal $15 minimum wage for Los Angeles workers. And though Mayor Garcetti has not announced any explicit support for a comprehensive minimum wage boost, he publicly lamented that the proposed $15 minimum for hotel workers wouldn’t have a wider reach. Even without a specific proposal, unlikely allies are beginning to line up behind the idea. Earlier this year, the Los Angeles Times reported that two of the city’s most powerful figures, billionaire businessman-philanthropist Eli Broad and developer Rick Caruso, publicly announced their support for a citywide minimum wage boost. According to the Times, Broad warned that the Los Angeles Area Chamber of Commerce should get in front of the issue, lest the city’s unions take the lead and accomplish increases on their terms. Recent developments may be proving him correct. Dreier tracks the roots of today’s efforts to raise the minimum wage back at least to 1997, when the city enacted legislation guaranteeing a living wage for workers employed by companies with city contracts. (Subsequent ordinances in more than 100 other cities used LA’s legislation as a model.) The living-wage ordinance was the first major victory for LAANE, which helped mobilize community groups to ensure that a veto-proof majority of City Council members would pass the ordinance. Further groundwork was established by various community benefit agreements, which made lucrative developments in the city, including the Staples Center, contingent on the provision of living wages. There are certainly strategic advantages to the incremental pursuit of minimum-wage increases. The quirks of the local economy make victories in certain sectors more likely than others. In the hospitality industry, for example, business interests may have less success claiming that rising labor costs will drive employers elsewhere, because wildly popular tourist destinations like Disneyland and Hollywood will continue to draw visitors who need a place to stay. Threats of layoffs are equally unlikely, Dreier said, because understaffing would likely saddle hotels with a reputation for poor service. Still, individual victories can pave the way for more ambitious measures by setting new precedents. “I think it’s important for there to be a beachhead in the private sector,” Dreier said of the pending hotel ordinance. One example of this collaboration is the Fix LA Coalition, an alliance that includes labor, community and religious groups. The Coalition lists a $15 minimum wage among its policy goals, and it received national attention after producing a report called “No Small Fees: LA Spends More on Wall Street than Our Streets.” The report documents the $204 million the city paid to financial services firms in 2013, a figure roughly $40 million larger than the amount spent on the Bureau of Street Services. Among other things, the report calls for the city to leverage the $106 billion that it sends through financial institutions to secure lower fees and restore recent budget cuts. Whether these demands will be met remains to be seen. Despite its progressive reputation, Los Angeles remains in the grip of devastating austerity measures enacted during the recession. It’s poverty rate, which hovered at more than 21 percent between 2008 and 2012, is also among the highest of any other major American city. Still, victories for minimum wage earners are making a difference. Agnes Radomski is a 2014 Summer intern for The Nation. Some of her work has appeared in The Irish Times and KPFK News. Follow her @AgnesRadomski.